Allison Winters is more of a hollow knave. Forgive me for being stereotypically girly, but I am terrified of bugs and all manner of creepy crawlies. Is there some deep psychological reason for this? Probably. Is it critical to this article? Not really, except that every foe in this game is a bug. Somehow, though, the game didn’t leave me a shambling mess of a human being. I guess I was too engaged in exploring and having fun to notice. Hollow Knight has you assume the role of what I guess is the titular knight. The game is not quite clear on who you are, but drops hints left and right that you aren’t exactly what you seem. Like in Ladykiller in a Bind where everyone is hidden behind the mask of a code name, here most characters hide behind literal masks. This imagery litters the game’s backstory and environments. It’s mostly used as a shorthand to denote that a character or foe was once a warrior that traveled into the caverns you’re exploring.The explanation for this in game is rather vague, with various flavor texts hinting that this is a tradition of the people of this world to honor a long forgotten hero. The masks end up giving most of your foes a very human like aspect despite them all being as mad as hatters due to the toxic effects of the caves. However, the masked marauders have a logic about them: “you’re in the way of my promised riches so you must die.” It’s a stark contrast to the more bestial creatures, beings of pure instinct that favor running full pelt into you. The sprawling caverns that these creatures inhabit are yours to go spelunking in for fantastical treasures. Hollow Knight is a Metroidvania style game that has you exploring the caves below a dilapidated town searching for an ancient city, Hallownest, and grabbing whatever isn’t nailed down. The mechanics are kept simple with the usual smattering of upgrades adding a few new twists to your treks. The upgrades mostly serve as mobility enhancers, allowing you to travel to new areas. The combat follows suit and stays basic, never going past whacking enemies on the face with simple sword strokes and dodging their violent rebuttals. This is not to say the the combat is boring, it expects you to learn enemy behaviors and read their attack cues lest you become a black stain on the floor. The game’s difficulty curve is rather unforgiving but hardly unfair. The game just holds you to high standards,so basically it’s like they programmed my dad into the game. However unlike my dad the game rewards you with upgrades to make things sail smoother and help promote a genuine sense of accomplishment for beating a particularly nasty opponent. Once you start stepping to the game’s beat everything feels natural. When a game is built around exploring and finding hidden items, the little clues and details are so important. Put too little effort into them and you’ve basically made a game designed to sell strategy guides, but putting the work into leaving subtle clues for the player leads to the player feeling accomplished. Hollow Knight succeeds in first doing just that, leaving hints strewn about and teaching the player how to ferret them out and learn to think like the game. By the time you have a few hours under your belt, the details stick out. You can pick out that a little alcove looks weird and think: I bet there’s a hidden money stash in there, and lo and behold you were right. This level of craft isn’t limited to the tiny details but is also reflected in the bigger and more obvious ways of teaching about how to overcome various obstacles such as flipping platforms, conveyor belts, and the more tricky foes. You’re given a reasonably safe environment to figure out a new type of platform or enemy, and once you have it starts throwing those hindrances into grander challenges. So far everything I’ve been describing is tops, this is a perfect game, 10/10 would play again. 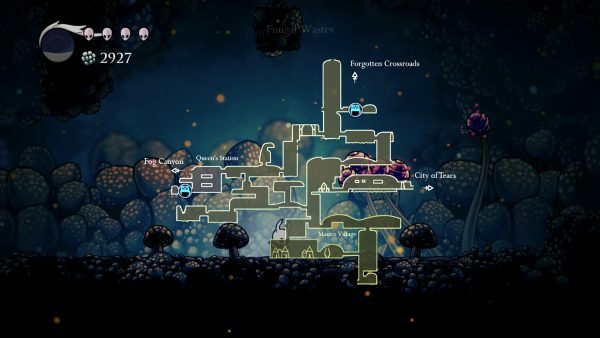 But I do have at least one gripe: despite Hollow Knight keeping its mechanics simple, seemingly the mapping system had to be as obtrusive as humanly possible. You buy maps from fellow explorer, Cornifer, except he’s only explored a section of the area and it’s up to you to complete it. But first you need to go back to the surface and buy a quill from his wife. Also you can only update your map at the benches that serve as the game’s save points. The Etrain Odyssey franchise has proved that making maps can be fun but here it’s just a chore. Though admittedly it’s not as obtrusive as I’m making it seem, and it’s more a crack on this game’s otherwise smooth face. Back to me slobbering over the level of thought and subtly put into the game. Despite how convoluted it can be, mapping out a new location draws you into the world and more into the atmosphere of the game. You have the distinct feeling that you are utterly alone in the caves, yes there are friendly faces here and there but the mask hides our protagonist and his true feelings. The Knight simply reflects those they encounter with no malice or any feeling at all. In the end it’s you, the depths you explore and your thoughts. The music seems in on this and keeps itself toned down, working to instill that sense of ambiance and solitude. The music becomes a strange companion that’s comforting in a way and welcomes you back to familiar places. Along with the visuals it gives every area its own personality, so even if you enter a previous area through a new entrance it’s immediately clear where you are, which is helpful for orienting yourself. Nowadays there are so many Metroidvania games that just scratch the surface of what made the genre’s namesakes great. 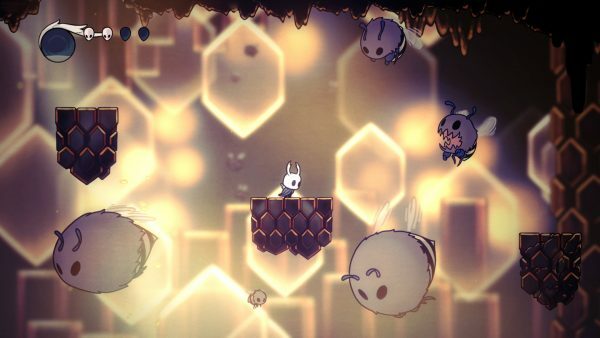 Hollow Knight by comparison has drilled to the core of its forefathers and come back with enough research to do a master level thesis on the subject. I’m probably beating a dead horse by now but detail is so critical in a game like this that it deserves repeating. This is a beautiful game with a brutal albeit rewarding difficulty curve that deserves a look see.